The Lockesburg Power Reclining Living Room Group by Signature Design by Ashley at Colder's Furniture and Appliance in the Milwaukee, West Allis, Oak Creek, Delafield, Grafton, and Waukesha, WI area. Product availability may vary. Contact us for the most current availability on this product. Tailoring Stripes and patterns are match cut. This style also features Jumbo Stitching. Padding & Ergonomics All fabrics are pre-approved for wearability and durability against AHFA standards. Cushions are constructed of low melt fiber wrapped over high quality foam. Design your entertainment space to be both comfortable and stylish with this upholstered collection. Leather match upholstery and features such as jumbo accent stitching create a cozy and welcoming look in your home. 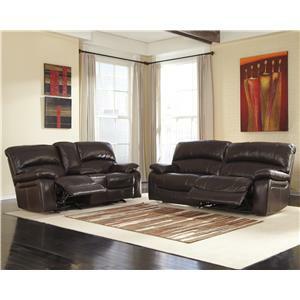 Available in both reclining and power reclining options, these pieces are ready to entertain your family and friends. The Lockesburg collection is a great option if you are looking for Transitional Casual furniture in the Milwaukee, West Allis, Oak Creek, Delafield, Grafton, and Waukesha, WI area. Browse other items in the Lockesburg collection from Colder's Furniture and Appliance in the Milwaukee, West Allis, Oak Creek, Delafield, Grafton, and Waukesha, WI area.